Ion Spark White Halogen Headlight Bulbs by Putco are a great solution to get rid of that dull yellowish light your factory headlight bulbs probably produce. These halogen bulbs are direct replacements for the bulbs already in your car and install in minutes. The light rating for these headlight bulbs is 3800k, which is has a White look to it. Maintaining a wattage rating comparable to your factory bulbs, Putco Headlights are safe to use with your factory wiring harnesses. 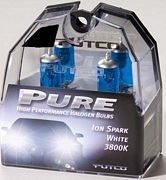 Your Putco Ion Spark White Headlight Bulbs carry a 1 year Manufacturers Warranty and are sold as a pair. Be sure to order the correct size headlight bulbs. You can consult your vehicle owners manual, or the link below can assist you in determining what size bulbs you need if you are not sure.